(Nanowerk News) You cannot get far today with electric cars. One reason is that the batteries require a lot of space. Fraunhofer scientists are stacking large cells on top of one another. This provides vehicles with more power. Initial tests in the laboratory have been positive. In the medium term, the project partners are striving to achieve a range of 1000 kilometers for electric vehicles. Production of the bipolar electrode on a pilot scale. Depending on the model, electric cars are equipped with hundreds to thousands of separate battery cells. Each one is surrounded by a housing, connected to the car via terminals and cables, and monitored by sensors. The housing and contacting take up more than 50 percent of the space. Therefore, the cells cannot be densely packed together as preferred. The complex design steals space. A further problem: Electrical resistances, which reduce the power, are generated at the connections of the small-scale cells. Under the brand name EMBATT, the Fraunhofer Institute for Ceramic Technologies and Systems IKTS in Dresden and its partners have transferred the bipolar principle known from fuel cells to the lithium battery. In this approach, individual battery cells are not strung separately side-by-side in small sections; instead, they are stacked directly one above the other across a large area. The entire structure for the housing and the contacting is therefore eliminated. As a result, more batteries fit into the car. Through the direct connection of the cells in the stack, the current flows over the entire surface of the battery. The electrical resistance is thereby considerably reduced. The electrodes of the battery are designed to release and absorb energy very quickly. "With our new packaging concept, we hope to increase the range of electric cars in the medium term up to 1000 kilometers," says Dr. Mareike Wolter, Project Manager at Fraunhofer IKTS. The approach is already working in the laboratory. The partners are ThyssenKrupp System Engineering and IAV Automotive Engineering. The most important component of the battery is the bipolar electrode – a metallic tape that is coated on both sides with ceramic storage materials. As a result, one side becomes the anode, the other the cathode. As the heart of the battery, it stores the energy. "We use our expertise in ceramic technologies to design the electrodes in such a way that they need as little space as possible, save a lot of energy, are easy to manufacture and have a long life," says Wolter. Ceramic materials are used as powders. The scientists mix them with polymers and electrically conductive materials to form a suspension. "This formulation has to be specially developed – adapted for the front and back of the tape, respectively," Wolter explains. 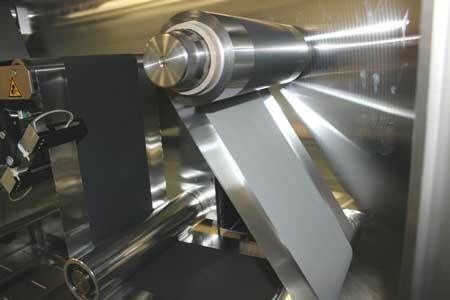 The Fraunhofer IKTS applies the suspension to the tape in a roll-to-roll process. "One of the core competencies of our institute is to adapt ceramic materials from the laboratory to a pilot scale and to reproduce them reliably," says Wolter, describing the expertise of the Dresden scientists.